The leading Mexican food brand in the UK, Old El Paso represents 58% of the sales of Mexican products within the broader World Foods category. The brand is now on a mission to drive further penetration and entice even more shoppers into the World Foods aisle. In particular millennials and young families with busy lifestyles looking for an easy and fun family meal. The media campaign will see Old El Paso back on screens with a new TV ad – ‘Talking Tacos’. 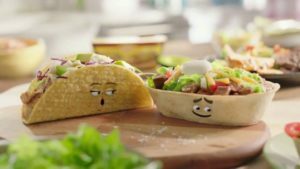 The ad highlights the fun and customisable nature of Mexican food and sees a ‘dad’ taco complimenting a ‘mum’ taco on her various add-ons, such as jalapenos, much to the embarrassment of their taco ‘daughter’. Already delivering strong uplift for the brand in the USA and Australia, the ad’s cheeky, light tone is set to be a huge hit with UK consumers. The advert will be supported by educational recipe content across social media, designed to inspire busy families with easy yet tasty shortcuts to a sit-down meal. A heavy weight of in-store marketing across UK grocers and independents will further drive shoppers towards Old El Paso’s leading range and boost overall category value. Alongside the fresh new advertising, the brand will undergo a packaging makeover. Rolling out this month, the renovated meal kits sport a more contemporary look, with improved appetite appeal through fresh on pack photography. Modern visual and verbal cues will support the brand’s ongoing mission to educate consumers on how to prepare and cook the kits. Talking Tacos will hit screens on 17th April and will run for three weeks.